The main issues are considered in this topic: creation of optimization algorithms electrical systems; development of specialized software; creating an effective method aided design of electrical systems of vehicles. Near Field Communication (NFC) technology is the future of m-Commerce, which has found possible application in contactless cards and mobile phone devices. NFC is technologically integrated with Data Ware House infrastructure and Cloud computing system which are incorporated in the e-Smart Business system. As a product of the implementation of NFC technology in m-Commerce business models there is a need of expansion B2B2C business model towards integration of services with the aim of creating new products, markets and consumer needs tuning. This paper presents a business model called e-Smart-Business as a system integration concept of m- Commerce through direct marketing and market research with the Data Ware House and Cloud computing systems. A retrospective review of a new technology, named SCP-RPSC, is given in this report. It is particular useful as the radio front end of the microwave communication systems with terrestrial and satellite positioning. SCP (Spatial Correlation Processing) technology includes additional pilot signal transmitted in the band of information signals and available in the receiver by one of the known methods of radio access. The receiver terminal is equipped with random phased antenna array. The random phase spread information and pilot signals correlate in a correlator. Its output signal at baseband is the recovered information signal. The application of SCP principle in transmit mode was named RPSC (Random Phase Spread Coding). The transmitted by the random phased antenna array signals have specific phase spread. It can be considered as random spatial coding. The advantages of the SCP-RPSC approach over classic microwave communication systems, based on phased antenna arrays, are shown. A list of possible communication applications as Satellite Digital Video Broadcasting , Inter Satellite Links, Feeder Lines, High Altitude Platform Systems, WIMAX, Aeronautical and Global Navigation Satellite Systems (GNSS) is given too. A retrospective review of a new approach, named Space Correlated U-PN codes, is given in this report. It is particular useful as spread spectrum radio access technology in the mobile broadband communication and radar systems with integrated terrestrial – satellite positioning. The principles of U-PN codes generation, as well as the basic methods of their acquisition and tracking, are given too. The proposed SC-CDMA principle uses several space distributed sources of radio-signals. The signals are phase modulated by appropriate PN-codes. The Mobile Stations (MS) receive these signals by means of the well known CDMA technology. For this purpose the same PN- codes are generated and synchronized in the MS receiver. The sum(mod2) of these codes creates a new code, which we named U (Unique)- PN code. This code is used for spreading the information, transmitted by the MS. Similar approaches are used for generation of the Base Station (BS) U-PN codes. Proposals of realistic SC-CDMA mobile communication and SC-MRN radar systems, based on the well developed GPS navigation, are shown in the end of the report. This paper describes the process of building special space of generalized functions, its properties and applications. Presented applications are: constructive solution of Kolmogorov-Feller type equation with polynomial drift coefficient; proof of exponential nature of equilibrium establishment in rarefied gas, described by Boltzmann equation of kinetic theory of gases. This article offers a new geometry model of ISAR image reconstruction procedure. Improved modeling and information analysis of ISAR systems are developed by implementation of detail 3D model of observed flying object. Simulation experiments are executed in MATLAB environment. The survey of the digital image quality appears to pass through a man’s perception. This leads to a one’s own personal decision. To bring tests on the quality of video information, methods for digital image processing analyses are utilized. Correlation between subjective and objective assessment is explored in this paper. A special video sequences are projected and the subjective influence is compared with a well-founded image quality metrics. 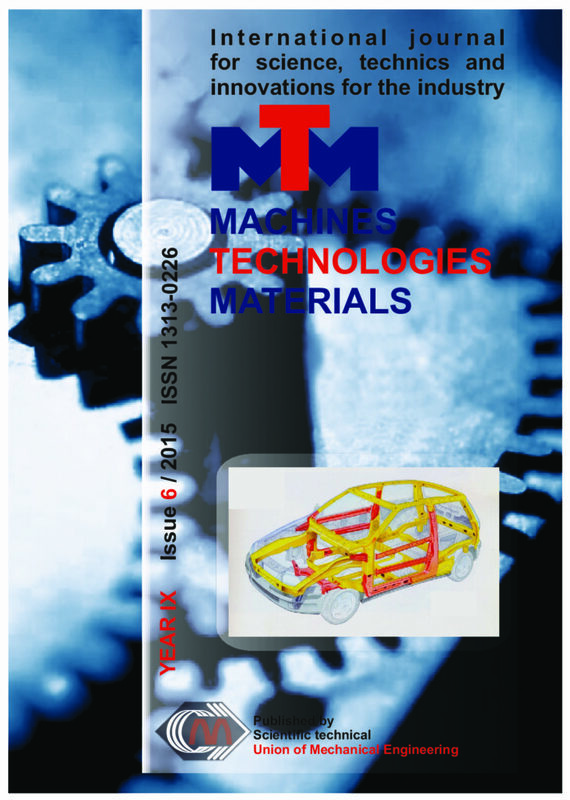 The article considers theuse of manufacturing schemes of thermomechanical processing for production of various machine parts. Schemes of machines for wire and the sized steel introduced on the industrial enterprises are given. Machineswere developed by research teamheaded by Professor Oleg .I. Shavrin at Kalashnikov Izhevsk State Technical University. Comparison of the reached parameters for the developed technologies with basis technologies of thermal processing (typical for the given details) was presented. The paper is a part of wider research based on the system approach to the problem of modelling and calculations of bolted flange connections. With this approach it is possible to independent consideration of each system’s element in order to find the best model of this element. The aim of this study is to develop a model of the single-bolted joint separated from the bolted flange connection. An analysis is conducted for the spider bolt model which is an equivalent model corresponding to the spatial bolt model. The key problem in the case of modelling bolts with the spider bolt model is adequate distribution of the preload on the bolt head. Accuracy of modelling bolts using the spider bolt model strongly depends on the way of this distribution. The effect of preload distribution in the spider bolt model on stiffness values of the element fastened in the bolted joint has been examined. The result of actions described in the paper is proposal distribution of the preload on nodes belonging to the bolt head which guarantees the best effects of spider bolt model application. The non-linear ship capsize equation derived by Thompson et al., that incorporates both direct and parametric excitation, is examined numerically in an attempt to deepen our understanding on the influence of the parameters involved in the final ship’s response. Because our interest is focused on the binary outcome of capsize-non-capsize, no remark of the steady-state onto which a non-capsize motion may settle is made. The four-dimensional phase-control space includes the non-dimensional damping coefficient, the ratio between wave frequency and ship’s natural frequency, and the direct and parametric forcing amplitudes. All the computed boundaries between capsizing and non-capsizing regions in bi-dimensional projections of control parameter space show fractal features. This paper is devoted to traffic safety and environmental protection in Serbia. Unfortunately the level of air pollution i.e. the level of emission of carbon dioxide in the world is still raising. Additional actions are needed in order to limit the effect of climate changes in the following years. People ask why electric vehicles aren’t main-stream? It seems that price has a lot to do with it. The Road Traffic Safety Agency with its systematic and responsible activities set clear guidelines for the monitoring and improvement of road safety in Serbia. In the Republic of Serbia from 1981 till 2013 in the traffic accidents 41.718 persons were killed. In the same period 632.936 persons were seriously injured. Republic of Serbia on the 16th of November 2011 began to commemorate the World’s Day of memory on victims in the traffic accidents. Law on road traffic safety came into effect in the Republic of Serbia in 2009. and brought many changes in our legal order. Majority of those changes meant harmonization with European Union regulation in the area of traffic safety. Changes made by the st new Law on infractions (“Officaial Gazette of the Republic of Serbia“, no. 65/13) in application from March the 1 2014. show the increase of penalties for unscrupulous drivers, but drivers complain on to many regulations and difficulties to get documents for motor vehicle use. In this paper there are mentioned the most efficient hybrids we can buy today. In Serbia “FIAT automobiles of Serbia” is still the leading exporter on the list of 15 biggest Serbian exporters, according to the data of the Serbian Ministry of Finances. In April 2015 at New York Auto Show will be possible to see all new accomplishments in auto-moto industry all over the world.